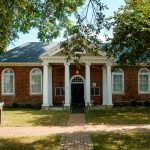 The first Jefferson County Courthouse was built in 1803 on a plot of land donated by George Washington in Charles Town in what at the time was the state of Virginia. 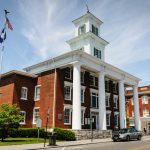 The original building was replaced in 1836 by a much larger structure which forms the core of the current courthouse. The red brick Greek Revival style structure is dominated by the large square wooden clock tower. 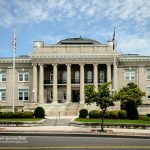 When the county was formed in 1801 it was named for the then President, Thomas Jefferson and it is Jefferson’s influence we see in the design of the current court house. Jefferson put forward the idea of use of architecture as a symbol. For him, architecture was a way to break free from colonial exploitation and educate a young nation about new social ideals such as liberty, self-rule and the right to pursue happiness. Jefferson felt these ideals were best represented by classical buildings found in ancient Rome and Greece. During the mid-19th century archeological investigations in Rome and Greece helped to bring about a period of great nostalgia for the ideals and culture of the past. This, combined with the need for increasingly larger and distinctive buildings, enabled architects to take the Greek temple idea promoted by Thomas Jefferson and develop it into a style that became known as Greek Revival. Romanesque Revival architecture, which combined elements of both Greek and Roman buildings, and Gothic Revival architecture, in which buildings were constructed in the fashion of medieval Gothic cathedrals, also became popular between 1820 and 1860. 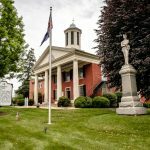 The Jefferson County Court House has been the site of two famous trials. The first was that of John Brown. Following his raid on Harpers Ferry in 1859, he and six of his men were brought to Charles Town to stand trial. 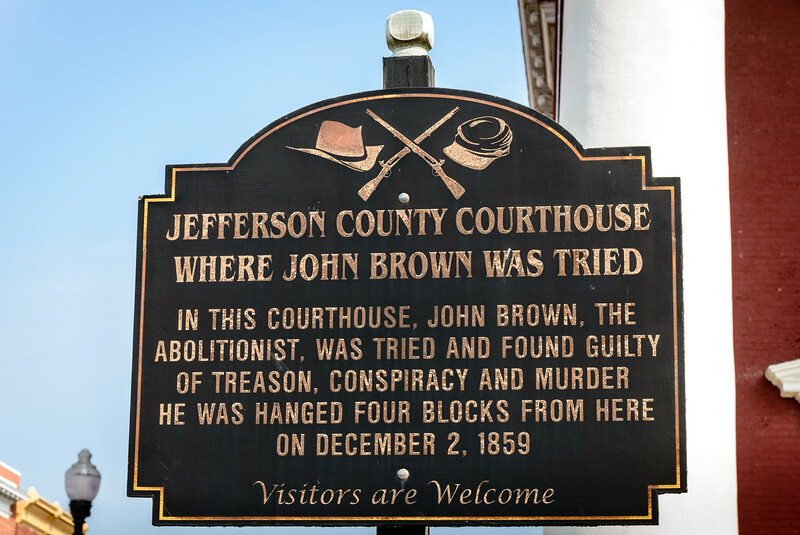 After being found guilty they were hanged a few blocks along Washington Street from the court house. The second famous trial was held in 1922. 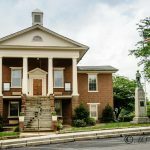 This was the trial of William Blizzard which came about after the Battle of Blair Mountain in the southern part of the state. The Battle of Blair Mountain was one of the largest civil uprisings in United States history and the largest armed rebellion since the Civil War. For five days in late August and early September 1921, in Logan County, West Virginia, over 7,000 armed coal miners confronted 3,000 lawmen and strikebreakers who were backed by coal mine operators during an attempt by the miners to unionize the southwestern West Virginia coalfields. 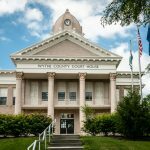 The trial was moved to the Jefferson County Court House as a result of a successful petition for a change of venue. Blizzard, who was one of the leaders of the miners, was charged with murder and treason. He was acquitted of the charges. 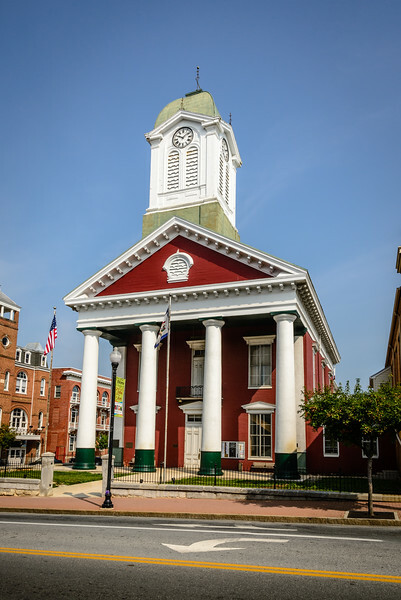 Jefferson County Courthouse is built on a plot of land donated by George Washington in Charles Town in what at the time was the state of Virginia.